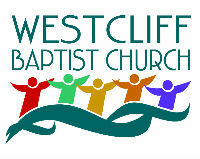 We are Westcliff Baptist Church in the seaside town of Westcliff-on-Sea, Essex. 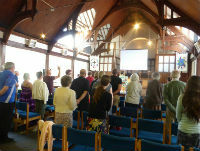 We are a warm and friendly family church reflecting the diverse population of the area. We aim to follow God the Father, His Son Jesus Christ and the Holy Spirit and to worship, build our faith, share our faith and serve in this place and community for this time. 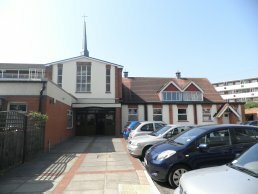 We are a Baptist Church affiliated to the Baptist Union of Great Britain. The church is led by our minister, John Western, and a team of deacons who are elected by the members. The minister and deacons meet monthly to discuss the spiritual and practical needs of the church but the final decision making body of the church is the monthly church members' meeting. The members are those who have been baptised and welcomed into membership by the church meeting. It is not necessary to be a church member to attend church, everyone is welcome to come and join us in worship and any of our activities. We welcome all to come and express or explore faith with us. What are our Sunday gatherings like? We start at 10.30am and normally aim to finish at about 12 noon. Our church has a wide variety of ages so we try to have an ‘all age’ feel to the start of the morning. There Sunday School and Youth Group every Sunday too. All our children’s workers have enhanced CRBs. We love to praise God so we do through prayer and we sing choruses and hymns with a good music group to lead us. We believe prayer makes a difference so we pray together every week interceding for local, national and international issues. The Bible is really important to us and currently we're enjoying a preaching program led predominently by our minister; however some Sundays are led by different speakers who, together with John, bring the Bible alive by teaching us, inspiring us, challenging us and showing us how it applies to our everyday lives. (Listen to some of the talks we've had on our Listen Again page). We use multimedia and have a good sound and viewing system plus an induction hearing loop. We take communion together most weeks, alternating morning and evening amd we welcome anyone who seeks to love and follow the Lord Jesus Christ to join in. We try to be a caring and supportive community; we share each other’s cares and concerns and enjoy each other’s celebrations. We laugh a lot and are known to hang about for ages after church drinking tea/coffee, chatting and sharing news, pastoral needs and concerns too. At 6.30pm we give the opportunity to meet together again. This is a very informal gathering but includes a lot of the same content as the morning and tends to be more interactive. What else goes on at WBC? We try to be a church that reaches out to our local community. So we have ‘sociable’ activities we do together. From time to time we offer walks, picnics, meals, BBQs, we’ve recently had a Barn Dance, music/concert evenings, anything that’s easy to come to ourselves and easy to invite our friends along to. We also have an annual Soccer School and a summer Holiday Club. We have just started a Men’s Group, have a thriving ‘CAMEO’ ('Come And Meet Each Other') group for those who enjoy social fellowship activities, puzzles and games, and an Alpha group for those who want to find out more or ask questions about the Christian life. All of these events aim to be crossroads or bridging places where we hope to provide a way of connecting the local church with the community and eventually through our friendship, example and encouragement to provide a way of them coming to know Jesus for themselves. We have midweek Bible Study and Prayer groups, these are really good for people who prefer to meet in a smaller group. They are informal and friendly. The church has a week of prayer 3 times per year meeting every day from Sunday to Friday. Various styles of prayer and themes are used, we like to get creative! For the last few years we have had a church Away Day. We have visited Barnards Farm and The Othona Community at Bradwell-on-Sea for these. They have been an opportunity for us to be together for a whole day, to worship, relax, chill, chat, eat, have fun and sometimes to take time to discuss important items together in a fresh environment. Of course the best way to see what we're really like is to come and find out for yourself - we look forward to seeing you!